See Curriculum Vitae (pdf, August 2018) for complete list. 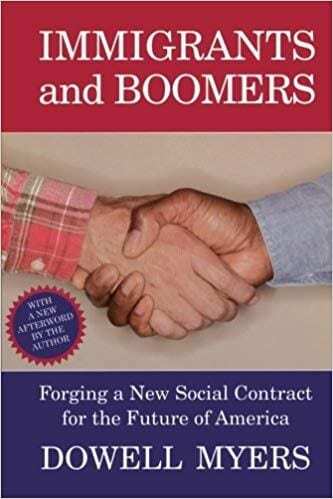 Myers, Dowell, Immigrants and Boomers: Forging a New Social Contract for the Future of America. New York: Russell Sage Foundation, 2007. Recipient of the Thomas and Znaniecki Award for best book on international migration, American Sociological Association, 2007. Named Planetizen Top 10 Book of 2007. 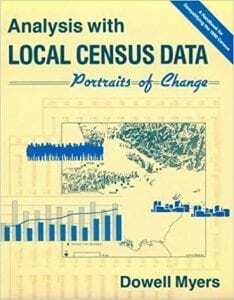 Myers, Dowell, Analysis with Local Census Data: Portraits of Change, New York: Academic Press, 1992; 15 chapters and 3 appendices. 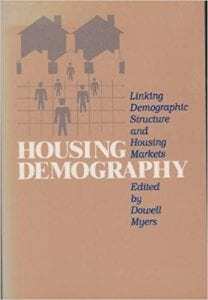 Myers, Dowell, editor, Housing Demography: Linking Demographic Structure and Housing Markets, Madison, WI: University of Wisconsin Press, 1990. Myers, Dowell and Morris Levy, “Racial Population Projections and Reactions to Alternative News Accounts of Growing Diversity,” Annals of the Academy of Political and Social Science 677 (May 2018): 215-228. Myers, Dowell, “Peak Millennials: Three Reinforcing Cycles that Amplify the Rise and Fall of Urban Concentration by Millennials,” Housing Policy Debate 26 (6, 2016): 928-947. Myers, Dowell, “Mutual Benefits and Equity amid Racial Diversity: A Generational Strategy for Growing a Broader Base of Support for Social Equity,” Journal of Planning Education and Research,” 35 (2015): 369–375. Park, Julie, Dowell Myers, and Tomas Jimenez, “Intergenerational Advancement of the Mexican-origin Population in California and Texas Relative to a Changing Mainstream,” International Migration Review 48 (Summer 2014): 442–481. Myers, Dowell, “California Futures: New Narratives for a Changing Society,” Boom: A Journal of California 2 (Summer 2012): 37-54. Pitkin, John and Dowell Myers, “A Period Summary Measure of Immigrant Advancement,” Demographic Research 24 (2011): 257-92; includes online workbook demonstrating the new method: http://www.demographic-research.org/volumes/vol24/12/. Yu, Zhou and Dowell Myers, “Misleading Comparisons of Homeownership Rates When the Variable Effect of Household Formation is Omitted,” Urban Studies 47 (November 2010): 2615-2640. Park, Julie and Dowell Myers, “Intergenerational Mobility in the Post-1965 Immigration Era: Estimates by an Immigrant Generation Cohort Method,” Demography 47 (May 2010): 369-92. Park, Julie, Dowell Myers, Dennis Kao, and SeongHee Min, “Immigrant Obesity and Unhealthy Assimilation: Alternative Estimates of Convergence or Divergence, 1995 to 2005,” Social Science and Medicine 69 (December 2009): 1625-33. Myers, Dowell and John Pitkin, “Demographic Forces and Turning Points in the American City, 1950 To 2040,” Annals of the American Academy of Political and Social Sciences 626 (November 2009): 91-111. Myers, Dowell, Xin Gao, and Amon Emeka, “The Gradient of Immigrant Age-at-Arrival Effects on Socioeconomic Outcomes in the U.S.,” International Migration Review 43 (Spring 2009): 205-229. Myers, Dowell and Cathy Yang Liu. “The Emerging Dominance of Immigrants in the US Housing Market 1970-2000,” Urban Policy and Research 23, 3 (2005): 347-65. Myers, Dowell, Gary Painter, Zhou Yu, SungHo Ryu, and Liang Wei, “Regional Disparities in Homeownership Trajectories: Impacts of Affordability, New Construction, and Immigration.” Housing Policy Debate 16, 1 (2005): 53-83. Myers, Dowell and Elizabeth Gearin, “Current Housing Preferences and Future Demand for Denser Residential Environments,” Housing Policy Debate 12, 4 (2001): 633-59. Myers, Dowell, “Introduction to the Symposium: Putting the Future in Planning,” Journal of the American Planning Association 67 (Autumn 2001): 365-67. Myers, Dowell, “Demographic Futures as a Guide to Planning: California Latinos and the Compact City,” Journal of the American Planning Association 67 (Autumn 2001): 383-97. Winner of 2001 Award for Best Article in the Journal. Painter, Gary, Stuart Gabriel, and Dowell Myers, “Race, Immigrant Status, and Housing Tenure Choice,” Journal of Urban Economics 49 (2001):150-67. Myers, Dowell and Alicia Kitsuse, “Constructing the Future in Planning: A Survey of Theories and Tools,” Journal of Planning Education and Research 19 (summer 2000): 221-31. Myers, Dowell, “Demographic Dynamism and Metropolitan Change: Comparison of Los Angeles, New York, Chicago, and Washington, D.C.,” Housing Policy Debate 10 (4, 1999): 919-54; reprinted in Michael J. Dear, ed., From Chicago to LA: Making Sense of Urban Theory, Thousand Oaks, CA: Sage Publications, 2001. Myers, Dowell, “Cohort Longitudinal Estimation of Housing Careers,” Housing Studies 14 (4,1999): 473-90. Myers, Dowell, Isaac Megbolugbe and Seong Woo Lee, “Cohort Estimation of Homeownership Attainment Among Native-Born and Immigrant Populations,” Journal of Housing Research 9 (2, 1998): 237-69. Myers, Dowell and Seong Woo Lee, “Immigrant Trajectories into Homeownership: A Temporal Analysis of Residential Assimilation,” International Migration Review 32 (Fall 1998): 593-625. Myers, Dowell and Cynthia Cranford, “Temporal Differentiation in the Occupational Mobility of Immigrant and Native-Born Latina Workers,” American Sociological Review 63 (February 1998): 68-93. Myers, Dowell, William C. Baer and Seong-Youn Choi, “The Changing Problem of Overcrowded Housing,” Journal of the American Planning Association (Winter 1996): 66-84. Myers, Dowell, Richard Peiser, Greg Schwann, and John R. Pitkin, “Retreat from Homeownership: A Comparison of the Generations and the States,” Housing Policy Debate 3, no. 4 (1992): 945-75. Myers, Dowell, “Upward Mobility and the Filtering Process,” Journal of Planning Education and Research, vol. 2 (1983): 101-112. Myers, Dowell and Hyojung Lee. 2016. “Cohort Momentum and Future Homeownership: The Outlook to 2050,” Cityscape: A Journal of Policy Development and Research, vol. 18 (March): 131-143. Myers, Dowell and Hyojung Lee. 2016. “Demographic Change and Future Urban Development,” chapter 2, pp. 11-58, in George McCarthy, Gregory Ingraham and Samuel Moody, eds., Land and the City, Cambridge, MA: Lincoln Institute of Land Policy. Myers, Dowell. 2013. “Diversity and Aging in America: Shifting Demographics Provide a New Opportunity for Planning Leadership,” Planning (March 2013): 10-15. Myers, Dowell and Sarah L. Mawhorter. 2012. “Filtering,” Encyclopedia of Housing, Andrew T. Carswell, ed., pp. 225-228, Thousand Oaks, CA: Sage Publications. Myers, Dowell, “The Contribution of Immigration to Reducing Aging in America: Application of the Senior Ratio to Census Projections,” Public Policy and Aging Report vol. 22 (Spring 2012): 1-7. Myers, Dowell, Anna Jacobsen, Sarah Mawhorter, and Joshua Wheeler, “Metropolis of Dispersed Diversity,” chapter 3, pp. 69-85 in David Sloane, ed., Planning Los Angeles (Chicago: APA Planners Press, 2012). Myers, Dowell, Janna Goldberg, Sarah Mawhorter, and Seong Hee Min, “Immigration and the New Maturity of Los Angeles,” pp. 12-27 in Ali Modarres, ed., Los Angeles 2010: State of the City, Pat Brown Institute, California State University, Los Angeles, 2010. Myers, Dowell, “California and the Third Great Demographic Transition: Immigrant Incorporation, Ethnic Change, and Population Aging, 1970-2030,” chapter in Philip Davies and Iwan Morgan, eds., America’s Americans: Population Issues in US Society and Politics, London, England: Institute for the Study of the Americas, 2007. Myers, Dowell, “Promoting the Community Future in the Contest with Present Individualism,” pp. 59-78 in Lewis D. Hopkins and Marisa A. Zapata, eds., Engaging the Future: Forecasts, Scenarios, Plans, and Projects, Cambridge, Mass. : Lincoln Institute for Land Policy, 2007. Myers, Dowell, “Cohorts and Socioeconomic Progress,” report in the series, We the American People. Population Reference Bureau and the Russell Sage Foundation, Washington, D.C.: 2004. 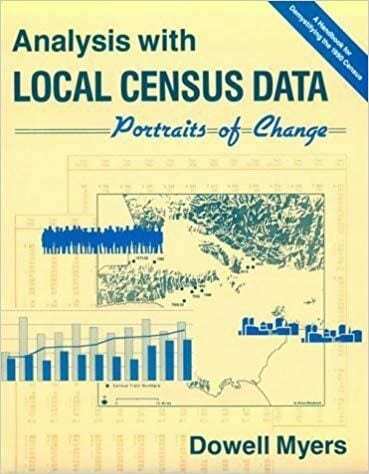 Reprinted in Reynolds Farley and John Haaga, eds., The American People: Census 2000, New York: Russell Sage, 2005, pp. 139-66. Myers, Dowell, “Advances in Homeownership Across the States and Generations: Continued Gains for the Elderly and Stagnation Among the Young,” Fannie Mae Foundation Census Note 08, 2001. Myers, Dowell, “Building the Future as a Process in Time,” pp. 62-65 in Metropolitan Development Patterns: Annual Roundtable 2000, Lincoln Institute for Land Policy, Cambridge, MA, 2000. Myers, Dowell, “Immigration: Fundamental Force in the American City,” Housing Facts and Findings (Fannie Mae Foundation), Winter 1999: 3-5. Myers, Dowell, “Upward Mobility in Space and Time: Lessons from Immigration,” pp. 135-57 in James W. Hughes and Joseph J. Seneca, eds., America’s Demographic Tapestry, New Brunswick, NJ: Rutgers University Press, 1999. Myers, Dowell, “Changes Over Time in Transportation Mode for Journey to Work: Effects of Aging and Immigration,” pp. 84-99 in Decennial Census Data for Transportation Planning, Volume 2: Case Studies, proceedings of a conference held in Irvine, California, April 28–May 1, 1996. Washington, D.C.: National Academy Press, 1997. 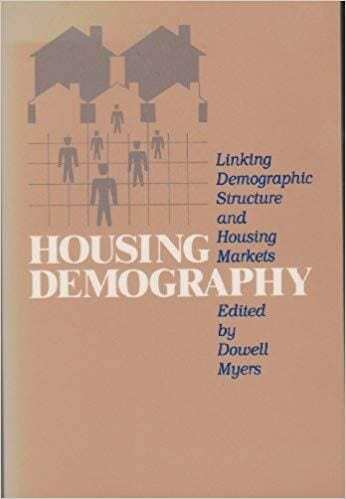 Myers, Dowell, “Filtering in Time: Rethinking the Longitudinal Behavior of Neighborhood Housing Markets,” in D. Myers, ed., Housing Demography: Linking Demographic Structure and Housing Markets, edited book from the University of Wisconsin Press, 1990. Myers, Dowell, “The Ecology of Quality of Life,” chapter in David J. Brower, David R. Godschalk, and Douglas R. Porter, eds., Understanding Growth Management: Critical Issues and a Research Agenda, Washington, D.C.: Urban Land Institute, 1989. Myers, Dowell, Hyojung Lee and Patrick Simmons. 2018. “Cohort Transitions and Age Group Analysis of Millennial Homeownership Demand: Understanding Trajectories of Recovery Following the Great Recession.” Working Paper. Washington, DC: Fannie Mae, April 2018. Myers, Dowell, “From Boom Crash Injustice to the New Maturity of Los Angeles: Demographics and Perception in 1992, Today, and the Future,” working paper, Sol Price Center for Social Innovation. Myers, Dowell, Gary Painter, Julie Zissimopoulos, Hyojung Lee and Johanna Thunell, “Simulation of Young Adult Homeownership Change through 2035: Effects of Growing Diversity and Rising Educational Attainment.” Final Report to Fannie Mae. Myers, Dowell, Gary Painter, Julie Zissimopoulos, Hyojung Lee and Johanna Thunell, “The Shifting Determinants of Young-Adult Homeownership Before and After the Great Recession,” Working Paper, Fannie Mae, Washington DC, November 2016. Myers, Dowell, Gary Painter and Julie Zissimopoulos, “Education and the Intergenerational Transmission of Homeownership,” Working Paper, Fannie Mae, Washington DC, July 2016. Myers, Dowell, Gary Painter and Julie Zissimopoulos, “The Role of Parental Financial Assistance in the Transition to Homeownership by Young Adults,” Working Paper, Fannie Mae, Washington DC, June 2016. Myers, Dowell, Gary Painter, Hyojung Lee and Jung Ho Park, “Diverted Homeowners, the Rental Crisis, and Foregone Household Formation,” Special Report, Research Institute for Housing America, Mortgage Bankers Association, Washington, D.C., April 2016. Myers, Dowell, Stephen Levy and John Pitkin, “The Contributions of Immigrants and Their Children to the American Workforce and Jobs of the Future,” Center for American Progress, Washington, DC, June 2013. Projections to 2030 and Comparisons to Recent Decades,” Special Report, Population Dynamics Research Group, March 2013. Myers, Dowell and John Pitkin, “Immigrant Contributions to Housing Demand in the United States: A Comparison of Recent Decades and Projections to 2020 for the States and Nation,” Special Report, Research Institute For Housing America, Mortgage Bankers Association, Washington, D.C., February 2013. Myers, Dowell, Linda Lou, Edward Flores, Hyojung Lee, Anthony Guardado, and Stephanie Young, “Community Profile for Los Angeles County in 2010,” Research Report, published by First 5 LA, June 2012. Myers, Dowell, Linda Lou, and Hyojung Lee, “Trends in Fertility and Motherhood that Underlie the Declining Child Population of Los Angeles County, report prepared for First 5 LA, May 2012. Pitkin, John and Dowell Myers, “Generational Projections of the California Population By Nativity and Year of Immigrant Arrival,” Special Report, Population Dynamics Research Group, April 2012. Lou, Linda, Hyojung Lee, Anthony Guardado, and Dowell Myers, “Racially Balanced Cities in Southern California, 1990 to 2010,” Population Dynamics Research Group, March 2012. Pendall, Rolf, Lesley Freiman, Dowell Myers, and Selma Hepp, “Demographic Challenges and Opportunities for U.S. Housing Markets,” Bipartisan Policy Center, Washington, D.C., March 2012. Myers, Dowell and John Pitkin, “Assimilation Tomorrow: How America’s Immigrants Will Integrate by 2030,” Center for American Progress, Washington, D.C.; November 2011. Pitkin, John and Dowell Myers, “Projections of the U.S. Population, 2010-2040, by Immigrant Generation and Foreign-Born Duration in the U.S.,” Special Report, Population Dynamics Research Group, October 2011. Myers, Dowell, “Attrition of Homeownership in California in the 2000s: Now Seeking Generational Replacements,” Special Report, Population Dynamics Research Group, July 2011. Myers, Dowell, Ray Calnan, Anna Jacobsen, and Josh Wheeler, “California Roller Coaster: Income and Housing in Boom and Bust, 1990-2010,” Special Report, Population Dynamics Research Group, April 2011. Myers, Dowell and John Pitkin, “Assimilation Today: New Evidence Shows the Latest Immigrants to America are Following in Our History’s Footsteps,” Center for American Progress, Washington, D.C., September 2010. Myers, Dowell and John Pitkin, with Sarah Mawhorter, Janna Goldberg, and Seong Hee Min, “The New Place of Birth Profile of Los Angeles and California Residents in 2010,” Special Report, Population Dynamics Research Group, March 2010. Myers, Dowell, “Benefits for California and Its Growing Number of Seniors of Expanded Access to Higher Education,” written testimony before the Joint Committee on the Master Plan for Higher Education, California State Legislature, February 2, 2010. Myers, Dowell, “The Demographics of Proposition 13: Large Disparities between the Generations and the Unsustainable Effects of House Prices,” Special Report, Population Dynamics Research Group, September 2009. Myers, Dowell, John Pitkin, and Ricardo Ramirez, “The New Homegrown Majority in California: Recognizing the New Reality of Growing Commitment to the Golden State,” Special Report, Population Dynamics Research Group, April 2009. Pitkin, John and Dowell Myers, “U.S. Housing Trends: Generational Changes and the Outlook to 2050,” Special Report 298, Transportation Research Board, National Academy of Sciences, September 2008. 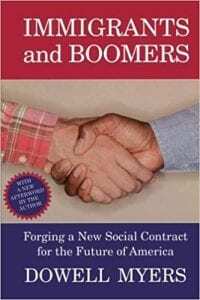 Myers, Dowell, “Immigrants’ Contributions in an Aging America,” Communities and Banking, 19, 3 (summer 2008), pp. 3-5, Federal Reserve Bank of Boston. Myers, Dowell, “Written Testimony of Dowell Myers,” before the House Committee on the Judiciary, subcommittee on immigration, at Ellis Island, March 2007. Myers, Dowell and Sung Ho Ryu, “Avoiding Failure to Launch: A Grown Children Benchmark for Projecting Future Housing Needs,” special report, Washington, D. C.: Fannie Mae Foundation, April 2006.
,” Applied Demography 19 (March 2006): pp. 8-10. Myers, Dowell, John Pitkin and Julie Park, “California Demographic Futures: Projections to 2030, by Immigrant Generations, Nativity, and Time of Arrival in U.S., Full Report,” Population Dynamics Research Group, School of Policy, Planning, and Development, University of Southern California, 2005. Myers, Dowell, Julie Park, and Sung Ho Ryu, “Dynamics of Immigrant Settlement in Los Angeles: Upward Mobility, Arrival, and Exodus,” Working Paper No. PDRG05-05. Myers, Dowell, Cohorts and Socioeconomic Progress, report in the series, We the American People. Population Reference Bureau and the Russell Sage Foundation, Washington, D.C., 2004. Myers, Dowell, “Accuracy of Data Collected by the Census Question on Immigrants’ Year of Arrival,” Working Paper No. PDRG04-01. Myers, Dowell and Julie Park “Racially Balanced Cities in Southern California, 1980-2000,” Working paper No. 2001-05, Population Dynamics Research Group, USC, May 2001.